On a warning sign, describe safe actions near pictured danger, or pictured safety? 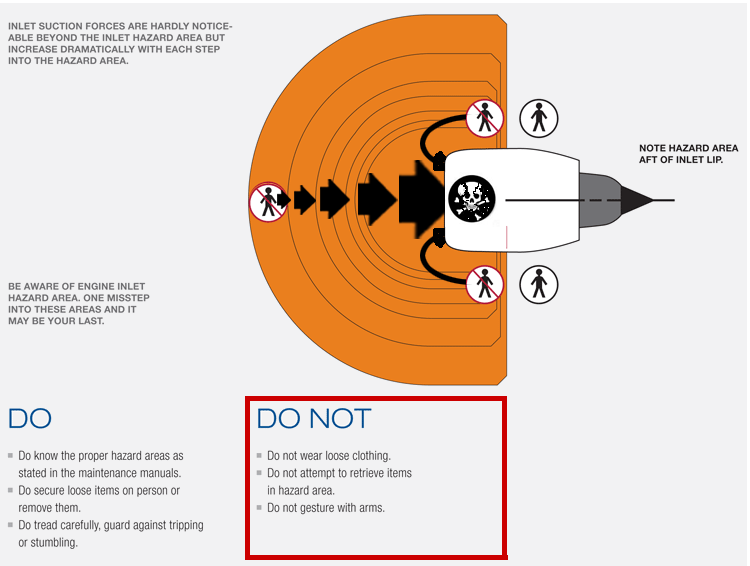 This thread on Aviation.SE raises an interesting question: what is the advantage in putting the "DO" actions below the hazard zone on the diagram, rather than below the safe zone? For context, this maps the area around a jet engine where you risk getting sucked into it. Would it be that the hazard zone draws more attention than the safe zone? I'm posting this largely because it triggered a lot of attention on Aviation.SE and I thought it merited analysis, and I imagine there is actually research and a clear answer on this topic. The list states things to DO and NOT to DO. The picture shows the areas where to BE and where NOT to BE. There is no direct relation between Doing things in the Be area and Not Doing things in the Not Be area. Or put in a different way, Do things should be done independently of the area, and Do Not things shouldn't be done independently of the area. It would probably be more clear to avoid any kind of visual relation between the Do list and Be picture. The other text actually refers to the areas in the picture so there it makes sense to layout it in relation to the picture. 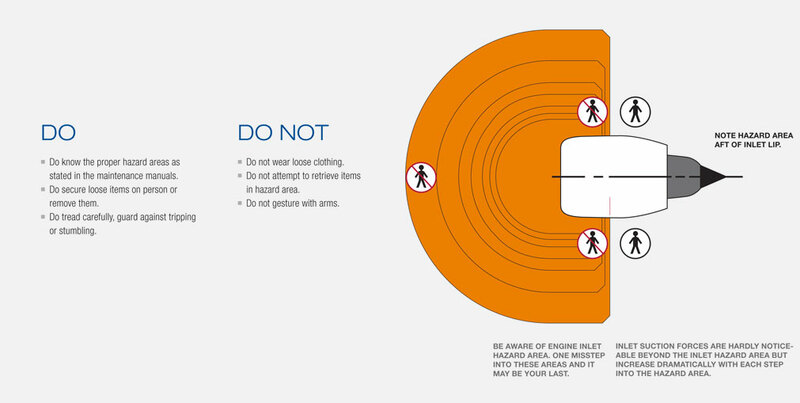 I suggest not splitting the Do and Do Not along the safety boundary in the diagram. Having them split like that makes one think one is for one side and the other is for the other, just like the "man" and "no man" icons. Next brings the confusion of the "Do" on the hazard side and the "Do Not" on the safe side. More mental processing needs done. And finally after reading the Do's and Don't's one figures out they apply to both safe and hazard zones. Oops. With the Do and Do Not moved off to one side it's clear these instructions apply to both. Not the answer you're looking for? Browse other questions tagged physical warnings signs or ask your own question.